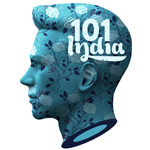 101India is the leading branded content, ideation and youth-focused online platform in India. It occupies a unique position in the Indian digital arena and targets the large millennial market, with counter and sub-culture content, and a broad array of original content offerings. The portal delivers a showcase of humor, travel, music, arts, culture and people profiles, with a focus on alternative content, satire and social commentary. The 101India management team has over 25 years’ experience in the creative and digital space, led by Cyrus Oshidar, former Creative Director for MTV India and Asia.